Historically black colleges and universities have endured and thrived because, just as in their early years, they are giving students the education they need and that we, as a community and as a nation, need them to have. In fact, research by UNCF’s Frederick D. Patterson Research Institute shows that historically black colleges and universities excel at graduating students the economy needs most: students from low-income families. “We know that students who enroll at HBCUs tend to have fewer financial resources and less rigorous academic preparation than students who enroll at non-HBCUs,” reported a study, "Understanding HBCU Retention and Completion." Focused on the need to feel connected—a sense of belonging—as an important driver influencing the decision to attend their institution of choice. Students spoke of their need to feel welcomed at their institutions and identified institutional characteristics that facilitated their abilities to adapt. … The students (also) described how meaningful relationships with faculty and the ethnic and academic diversity on their campuses enhanced their academic engagement and sense of self. 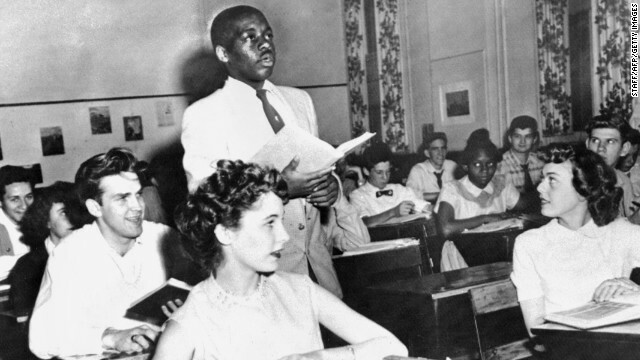 When Lincoln University opened its doors, few other colleges would admit black students. Lincoln and all the historically black colleges and universities that followed changed that. Today, African-Americans with college degrees are our nation’s teachers, doctors, lawyers, scientists, corporate executives, mayors, governors and members of Congress. In years to come, they will continue in these roles and also assume vital science, technology, engineering and math jobs to move our nation forward. For 159 years, historically black colleges and universities have shaped our history. Today, they are shaping our future. The opinions expressed in this commentary are solely those of Michael Lomax. It is as logical as the AT&T commercial with the children sitting around the spokesman (smile). More means MORE. Despite your interpretation of my earlier post, every black child does not NEED to attend a HBCU but statistically MORE OPPORTUNITIES vs. LESS OPPORTUNITIES should be available. Are you aware that there is an executive order to support the increase of HBCU graduates by 2,000,000 by year 2020? Did you attend a HBCU? In the USA only 2% of the adult population is BLACK with a college degree OR ABOVE. Why would anyone seek to reduce/consolidate/eliminate/discourage BLACK YOUTH from attending ANY college? Is it because some feel that 2% taints the milky white economy too much? In 2013...and beyond...there is a NEED for opportunity and advancement. PERIOD. @hbcukidz – where did you get your '2%' figure from? There is a database provided by the US Census. @hbcukidz – sounds pretty low. Thanks. Exactly. 2% can NOT taint milk. DO YOUR OWN MATH. Take the % of African Americans in USA. Multiply by the % of African Americans attained bachelors degree or ABOVE. Cheyney University of Pennsylvania has been recognized as the Nation's Oldest HBCU by the state of Pennsylvania and the Federal Government (Jimmy Carter as President). When writing factual pieces, let's make sure not to omit historical facts. Cheyney University of Pennsylvania has been recognized as the Nation's Oldest HBCU by the state of Pennsylvania and the Federal Government (Jimmy Carter as President). I applaud the past efforts of the HSBC, but strong consideration should be given to consolidating the 105 colleges. I realize that people would violently disagree with me, but think of the economics. It is better to have 105 colleges struggling for economic survival or have a strong amount of fewer economically strong colleges to compete in the 21st century. The online education trend will continue to be a viable option for a growing pool of students. Are the HSBCs capitalizing on that trend? If you are competing for a position, do you think the employer will evaluate you the same as they would another application for a traditional college? What percentage of the professional positions that you apply to will have a majority of African Americans in the hiring department? These are the challenges that must be discussed. The answers and conclusions to these questions will have you decide if the HSBCs have outlived their usefulness. You need to watch the movie Django. You sound like Stephen, of course ANY employer will find you more relevant just as the other colleges. Stop thinking backwards, today what is needed is STEM degrees that's all. You will be employed right after graduation, from ANY HBCU. Just graduate. I don't know what field you are in and what hiring teams you have participating in, but I disagree. The question was are HSBCs relevant? When a company is losing market share, they explore mergers and acquisitions. Not all of the HSBCs are economically sound. "If you want to be a Big Troublemaker, you better be a good shot". Django learned how to shoot the pistol with Dr. Shultz. I will let you put together the rest of the analogy. I graduated in Wiley College, Marshall Tx, class of '87. Long live the great Wiley College. I came all the way from West Africa to Marshall (wiley College). I had a great history Professor by name Mr Thompson. One of the best professor wiley college had. Wiley college was home to me. The students were great, faculty and workers were very special to us african Students. Dr Hayes was the president then, was a nice man. My kids will be heading to Black college. You for got to add president.